Photo: Norwegian Coastal Administration. What could have caused a major oil catastrophe is still a major economic blow to Equinor. The frigate “Helge Ingstad” costs about NOK 4 Mrd, but the affected oilfields are producing values worth of NOK 500 million every day. The accident caused shut down of the Sture-terminal, affecting natural gas (LPG) transport to Europe. Several oilfields and the Kollsnes processing plant nearby, are also affected. The collision with an oil tanker early Thursday morning happened just north of Bergen. The crew of 137 are all evacuated from “KNM Helge Ingstad” the Joint Rescue Coordination Center of Southern Norway informs. Eight of the crew members got minor injuries, but are all safe, the Norwegian Navy informed at a press conference. The frigate is taking on lots of water, nearly capsizing, and was for long in danger of sinking. Weather in the area is good and the frigate is grounded just by the shore. Like other naval vessels on duty, the frigate carries weapons, like missiles, torpedoes and depth charges. The Aframax tanker “Sola TS”, is not in danger and no oil-spill is reported from the tanker. There are some 625,000 barrels of crude oil on board. It was just after 4 am Norwegian time this morning the collision happened as the frigate was en route back to Haakonsvern naval base near Bergen after participating in the NATO exercise Trident Juncture. The exercise ended on November 7th. At the time of the collision, it was still dark. “KNM Helge Ingstad” (F313) is one of the Norwegian navy’s five frigates of the Fridtjof Nansen class. The warship was launched in November 2007. The 134-meter long vessel is 5,290 tons with full load. The ship is named after a famous Norwegian Arctic explorer, like the other four frigates in the Norwegian navy. Last year, “KNM Helge Ingstad” sailed the waters at Svalbard in the Norwegian Arctic and made port call to Longyearbyen. The ship has also been along the coast of Finnmark on several voyages in the Barents Sea. In 2011, “KNM Helge Ingstad” made a port call to Severomorsk, the main base of Russia’s Northern Fleet on the Kola Peninsula. 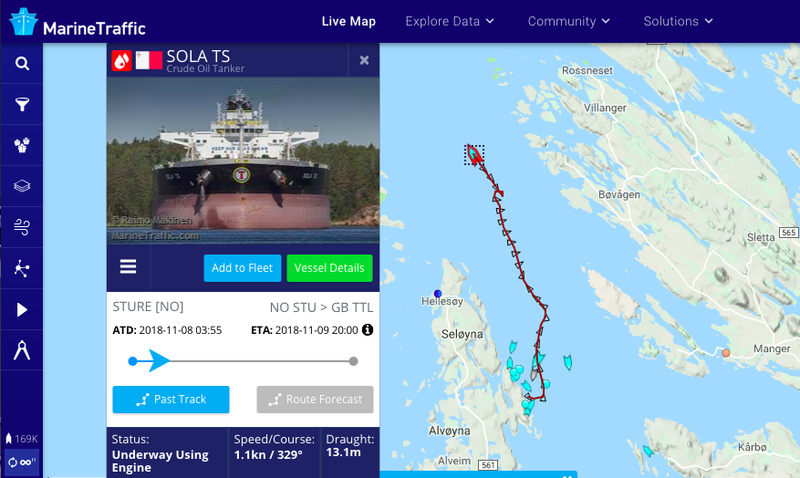 The tanker “Sola TS” was sailing from the oil terminal Sture. Equinor, operator of the terminal informs that operations at the terminal are now shut-down in standard security procedures and the only workers still at the terminal are there to maintain safety. Information about the cause of the collision is yet to be made public. Happening just outside Sture oil terminal, the accident raises a lot of questions. Here, the shipping is strictly controlled and oil tankers leaving the port are always followed by tugs and pilot. A third vessel, a tug following the tanker, was near, but not directly involved in the collision.